The Havana Hopewell culture were a Hopewellian people who lived in the Illinois River and Mississippi River valleys in Iowa, Illinois, and Missouri from 200 BCE to 400 CE. They are ancestral to the groups which eventually became the Mississippian culture of Cahokia and its hinterlands. 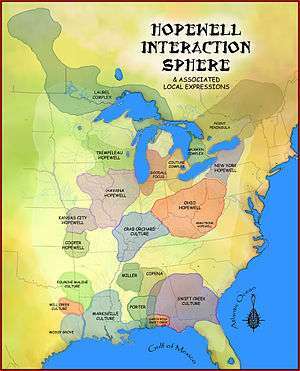 The Hopewell Exchange system began in the Ohio and Illinois River Valleys around 300 BCE. The culture is referred to more as a system of interaction among a variety of societies than as a single society or culture. The central Illinois River Valley was home to one particular complex, the Havana Hopewell culture. Havana Hopewell sites have been found in Illinois, northwest Indiana, southwest Michigan, southern Wisconsin, and Minnesota and northeast Iowa. Hopewell trading networks were quite extensive, with obsidian from the Yellowstone area, copper from Lake Superior, and shells from the Gulf Coast. The Toolesboro Mound Group in Louisa County, Iowa included a large octagonal earthen enclosure that covered several acres; earthworks of this style are reminiscent of the monumental construction seen in Chillicothe and Newark, Ohio. It also has a group of seven burial mounds on a bluff overlooking the Iowa River near where it joins the Mississippi River. The conical mounds were constructed between 100 BCE and 200 CE. At one time, there may have been as many as twelve mounds. Mound 2, the largest remaining, measures 100 feet in diameter and 8 feet in height. This mound was possibly the largest Hopewell mound in Iowa. Dickson Mounds is a settlement site and burial mound complex near Lewistown, Illinois, and is located in Fulton County, Illinois on a low bluff overlooking the Illinois River. ↑ Guy E. Gibbon, Kenneth M. Ames. Archaeology of prehistoric native America: an encyclopedia. p. 347. ↑ "Havana Hopewell". Retrieved 2010-07-09. ↑ "History". 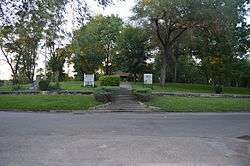 History of Dickson Mounds Museum webpage. State of Illinois. Retrieved 2008-05-05.